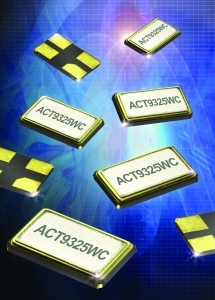 With a miniature footprint of 3 x 2.5mm, the ACT9325WC is a competitive alternative to 32.768kHz oscillator circuits based on multiple discrete devices. In addition to increasing reliability, the ACT9325WC simplifies manufacturing by featuring an AT precision-cut quartz blank which achieves stability of between ±20ppm and ±100ppm and eliminates the need for frequency-matching of discrete crystals. To extend battery life in handheld applications, the ACT9325WC features low power consumption of 0.6µA for the 2.5V device, and 1.0mA for the 3.3V version. There are two operating temperature ranges available: -20 to 70 and -40 to 85 degrees Centigrade. Samples of the ACT9325WC are available from ACAL. To further accelerate the transition through design and prototyping to full production, ACAL provides specialist support during development, using its UK in-house testing services for frequency-control devices. These services include the testing of crystal and oscillator parameters and characteristics, shock and solderability testing, as well as high-temperature storage.